The stylish public convenience in Strait Street. Right: Villa Aspinall, Tarxien, after restoration. Din l-Art Ħelwa (DLĦ) announced its Architectural Heritage awards last Friday. This is an initiative taken by the organisation to encourage architectural excellence in the Maltese context, the rehabilitation and reuse of old buildings, and the recognition of the dedicated work of those active in the field of restoration. The panel of judges was composed of former DLĦ president Martin Scicluna, Conrad Thake, representing the Chamber of Architects, art historian Keith Sciberras, and DLĦ council member Maria Grazia Cassar. Although this year there were fewer projects which, while entirely worthy and commendable, did not quite match the glamour, high profile and ambition of the 2010 entries, this did not in any way underplay the importance of this year’s submissions, the NGO said. There were no submissions this year in Category A – Major regeneration projects, or Category C – Restoration and conservation projects. There were, however, two most deserving entries in Category B dealing with rehabilitation and re-use of a building. Mr Scicluna pointed out that criteria for judgement was based on the quality of the work executed, its historical, cultural, educational and social relevance, the research conducted and the aesthetic and visual merit of the project. “The overriding consideration is the significance of the project within the Maltese context and its contribution to Maltese cultural heritage,” he added. The judges concluded it would award two diplomas to two quite different, but most worthy, projects in Category B, Rehabilitation and re-use. Culture Parliamentary Secretary Mario de Marco presented the first prize to architect Aaron Abela for his restoration of Villa Aspinall in Tarxien. The judging panel considered this rehabilitation, which was completed within a very limited budget, to be most deserving of recognition, as the preservation and rehabilitation were well thought out and most sensitively executed. No structural interventions were made to this lovely 19th century villa, which is now converted to a fully functioning office. Best practice in conservation was followed and the villa offers an excellent example of how a large town house can be used successfully for other purposes without resorting to demolition and re-building. Villa Aspinall successfully combines utility and practicality with the visual and aesthetic integrity, a glowing example of how a restoration of this kind can contribute to the regeneration of a town centre. The second diploma in the same category was presented to Architect Chris Briffa for a most unusual project, the highly imaginative restoration, rehabilitation and re-use of the public convenience in Strait Street, corner with Old Theatre Street. Mr Scicluna explained that, as in the days of Ancient Rome, firm indication of the civilised nature of any advanced city can be judged by the nature of its public lavatories. Briffa set out to challenge the normal concept of a public convenience by designing the Strait Street public lavatories so that they do not only respond to hygiene and function, but are also an exciting, colourful and provocative design. 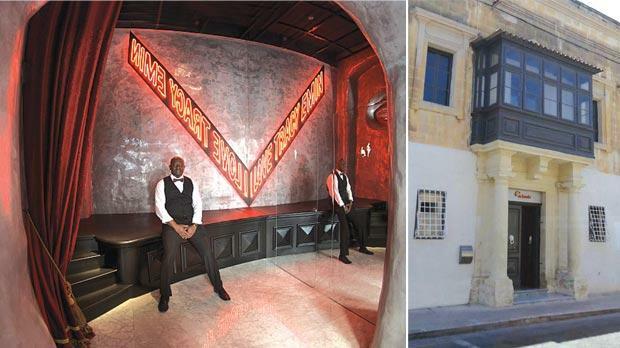 Strait Street is the first of five public conveniences in Valletta to be given this highly original treatment. When Valletta becomes the European Cultural Heritage City in a few years’ time, no space within the capital city, no matter how mundane its function, should be overlooked and not treated as a designed space. Mr Scicluna said it was encouraging to see the planned improvements now afoot at Fort Manoel and in Valletta, where great strides were finally being taken to enhance the beauty of the capital city. “We are thrilled by the work going on to restore our fortifications and excited about the prospect of seeing Fort St Elmo restored to its glory,” he said. DLĦ’s Award for Architectural Heritage was conceived in 2005, the organisation’s 40th anniversary year, primarily to encourage better architecture and, in the awareness of the urgent need to improve quality in construction development, as a means of contributing to the debate on the standards of Maltese architectural design. DLĦ works closely on this with the Chamber of Architects, which offers its support in encouraging architects to produce work that is of quality design, respects the outstanding tradition of built heritage stretching back thousands of years, sends a clear message that old buildings can be successfully restored and that tasteful contemporary architecture plays a vital part in the beauty of Malta.